Age as on 01-01-2019, Relaxation as per SSC Rules. Educational Qualification : Passed Intermediate Exam from any Recognized Board. (Note Read Official Notification Before Apply). Eligible Candidates can Submit Application at the Official Website of SSC latest by 19th November 2018. 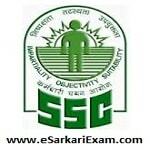 Click on SSC Steno Grade C & D Exam 2018 Advertisement Link.